The Consortium is currently comprised of six Member Organisations who are responsible for the policy, strategy, governance and financial control of CASE. For further information on each of the member organisations, click on the logos to take you to their individual websites. The British Medical Ultrasound Society (BMUS) originated in 1969 from a conference organised by the Hospital Physicists Association. 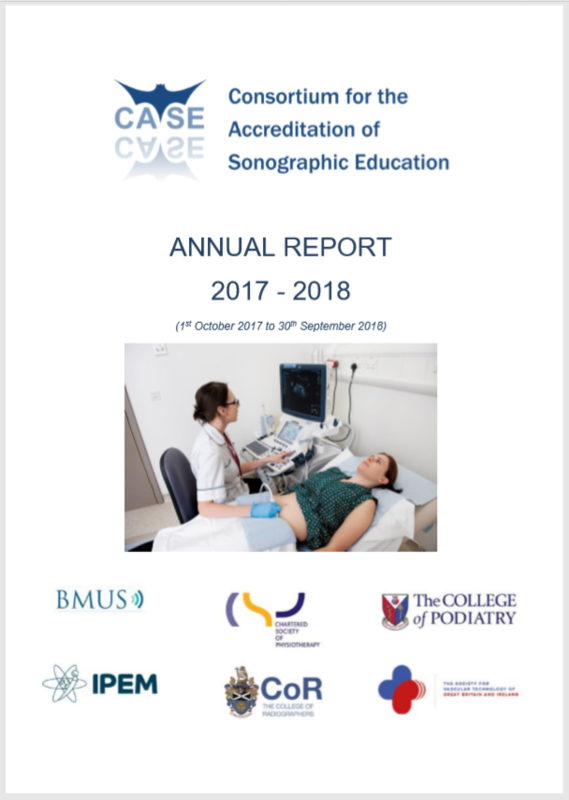 Membership is drawn from a wide range of disciplines including medical and allied health professionals, physicists, engineers, nurses, midwives, technicians, general practitioners, vets and others with an interest in medical ultrasound both in the UK and overseas. The Chartered Society of Physiotherapy (CSP) is the professional, educational and trade union body for the UK's 54,000 chartered physiotherapists, physiotherapy students and support workers. The Institute of Physics and Engineering in Medicine (IPEM) is the Learned Society and professional organisation for physicists, clinical and biomedical engineers and technologists working in medicine and biology.Their aim is to advance physics and engineering applied to medicine and biology for the public good. The Society and College of Radiographers (SCoR) is the only body in the UK representing the whole of the radiographic workforce. They are a trade union and professional body representing the professional, educational, public and workplace interests of their members. Founded in 1920, they are one of the oldest and most experienced radiography organisations in the world. The Society for Vascular Technology of Great Britain and Ireland (SVT) was formed in 1992 to advance non-invasive vascular diagnostic services by promoting training and research in Vascular Technology and to disseminate the results of such research for the benefit of the public. In bringing together all those engaged in providing vascular laboratory services, the SVT now functions as the national scientific and educational society for Clinical Vascular Scientists working in Great Britain and Ireland.